What a great marriage of two abundant summer staples in the height of their season-corn and blueberries- in this Maine Blueberry Cornbread recipe! Like any good couple, they complement each other well: the blueberries bring moisture to the traditionally dry bread, plus a sweetness to the course, earthy base. I think these two are going to be very happy together. I love how this recipe adapts a traditional hearty winter bread into a light, sweet treat for summer. 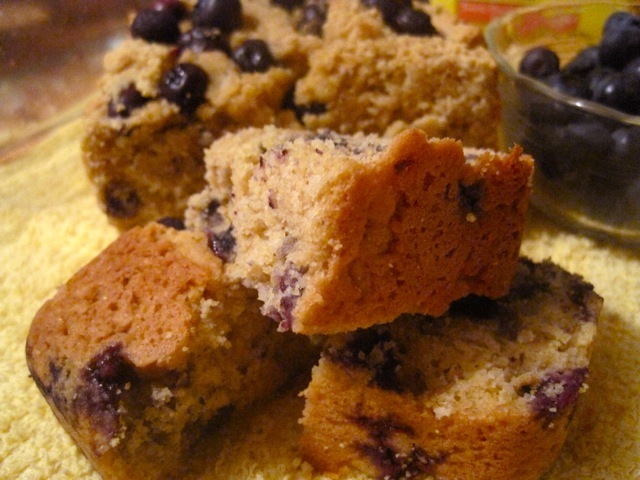 However, because frozen blueberries are an option here, this cornbread can be made all year around. Whole wheat flour added to course cornmeal creates an earthy whole grain base, and 2/3 of the fat traditionally derived for butter are substituted for a heart-healthy vegetable oil such as olive oil or canola. Honey adds a lovely floral fragrance that gives more depth to the bread than granular sugar, and further brings out the natural sweetness of the blueberries. I toyed with the idea of adding fresh corn kernels to the recipe, but ultimately decided against it to preserve the light and airy nature of the cornbread. If possible, eat this blueberry cornbread while still hot: the blended flavors are truly mouthwatering fresh out of the oven. Optional toppings include, jam, butter, or an extra drizzle of honey. Try a few fancy butter ideas from Recipe Girl: honey-cinnamon butter (1 stick softened butter + 1 tablespoon honey + 1/2 teaspoon cinnamon) or maple butter (1 stick softened butter + 1 tablespoon maple syrup). Chop into large squares for an easy on-the-go breakfast or serve as a mid-afternoon snack with a hot cup of tea. This Maine Blueberry Cornbread also makes a great addition to a late summer picnic: wrap a loaf and pass around to break off piece by piece. 1. Preheat oven to 400 degrees. Spray a bread/loaf pan with nonstick spray. 3. In a small bowl, add the oil, softened butter, honey, buttermilk and egg and mix until creamy. Add to dry ingredients until a lumpy batter forms. Gently fold in the blueberries, and once patter is set in pan, sprinkle  remaining 1/4 cup blueberries on top. 4. Bake at 400 degrees for 25-30 minutes or until the bread is golden brown, and a toothpick insterted into the center comes out mostly clean.